After a few bumps in the road in the first few games of the season, the new-look Oklahoma City Thunder seem to be figuring some things out both offensively and defensively, after their first quality win on the road over the Milwaukee Bucks. The question was never whether this team could score or not, it was about their chemistry and their defensive play. There were many whispers about their defense being improved from last year after acquiring another wing defender in Paul George, but how improved would they be? After immense criticism from fans (many being local), radio personalities and more, Andre Roberson stepped up and showed the NBA what he's been showing over the course of four seasons now. Tuesday night was their biggest test thus far, with OKC's chance to defend Giannis Antetokoumpo. His primary defender was Roberson and he showed why he's worth his $10 million contract with the Thunder. Antetokoumpo finished Tuesday's game with 28 points on 9-of-14 shooting, but a large portion of his points came when Roberson was on the bench. He struggled to create anything offensively against him. During the third quarter, Roberson held Giannis to four points. Around the four-minute mark, Roberson was called to the bench. That's when we witnessed the Greek Freak's onslaught of scoring where he finished the third quarter with 16 points. There is immense value in having Roberson on this team. With the combination of four players in the starting five averaging 78 points per game, the desperate need for him to score isn't as high as it has been in the past, especially last season. 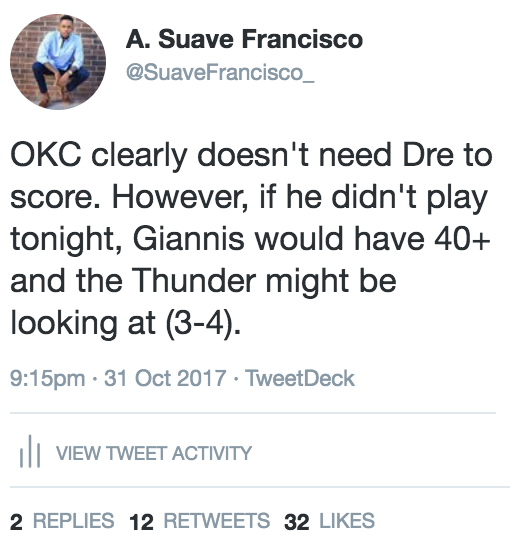 But the Thunder do need a defensive specialist because, without Dre, they wouldn't have one. Yes, George is considered a two-way player, but it's a stretch considering him a specialist and most championship-caliber teams have a lockdown defender on their roster or are very stout defensively as a collective unit. Now that everyone gets the point about Roberson and his defense, elaborating on how improved this team already is compared to last year is the only option. Obviously, when you add Anthony and George to the same team that the reigning scoring championship of the NBA calls his own, things are going to get fun. Despite some unwarranted criticism of this team's progression through the first five or six games of an 82-game season, there are clear signs of this being a great, championship-contending team. Russell took almost no time adjusting his game to fit both Melo and PG's, while Melo knew what his role was from game one and Paul seems to be figuring things out. Many were skeptical of the idea of bringing on two players that thrive off isolation ball onto this team, but they forgot that Westbrook nearly led the NBA in assists last season and now look, he's doing just that. With 75 games left to play in the regular season, there will be ample time for this offense to mesh even more before the second season (the Playoffs) come around. Greatness takes time both offensively and defensively. It will take almost a fourth of the season before anyone should expect to see them starting to reach their full potential and honestly, they are further ahead than expected now, on the last day of October.